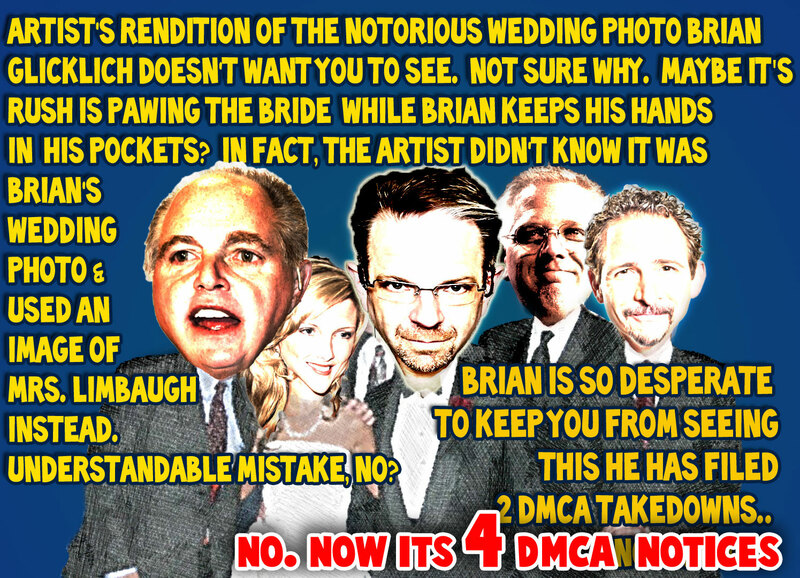 This picture stands in for a wedding picture (with Brian Glicklich, Rush Limbaugh, Phil Hendrie, Bill Handel, Glenn Beck, & Jim Rome ) which was removed by a bogusly reported as a DMCA violation. 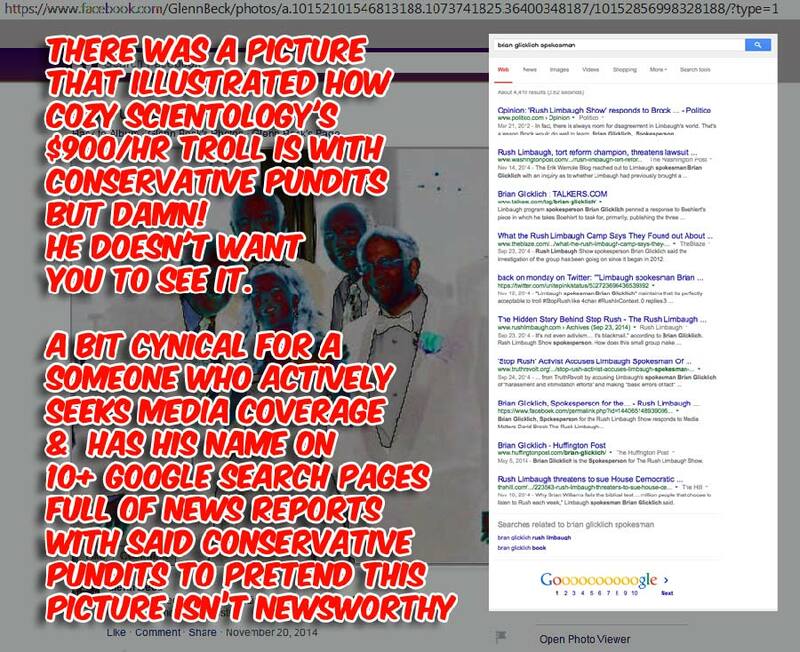 Curious that Brian Glicklich, who works for the Public Relations firm that represent the Church Of Scientology, is so concerned about these relationships with conservative pundits being publicized that he reports the fair use of this image as a DMCA violation. Brian Glicklich is the Spokesperson for The Rush Limbaugh Show and Chairman of Sitrick digital practice. 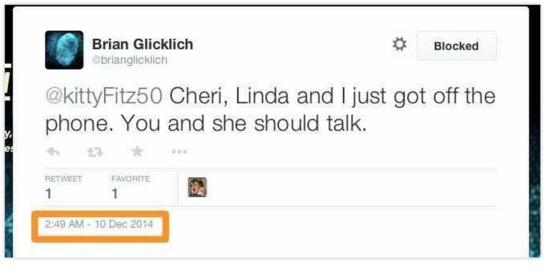 Since August of last year, Glicklich has added Professional Cyberstalker to his resume. His target? #StopRush. This is one busy dude. Considering Limbaugh is paying him $900/hour, the hustle is worth it. 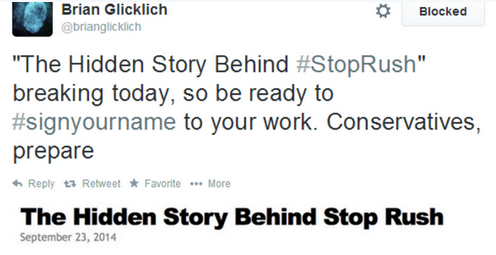 The #StopRush tweets in this article are just a few of the hundreds that @BrianGlicklich has posted. Carol reports she felt like someone had punched her in the gut. Carol does not see a Pulitzer Prize in her immediate future so the “horrible writer” statement was ridiculous. However, seeing her name posted by this cyberbully left her nauseous, frightened and intimidated. 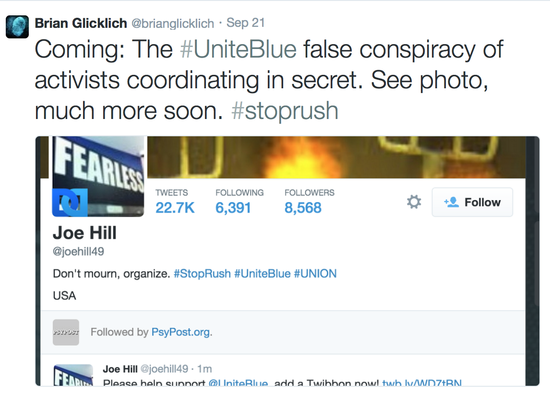 After several dozen threats directed at #StopRush in general and specific volunteers in particular, Glicklich issued his Grand Opus via Twitter on September 23, 2014. This tweet links to the Rush Limbaugh website and a story filled with lies and misinformation. Glicklich reports that 10 people are responsible for 70% of the tweets and that just a small number of “political activists” are involved. It’s truly unbelievable that in the last three (3) years just 10 people are responsible for over 3,100 advertisers giving Limbaugh the heave-ho. Extensive research has revealed that not one of them makes $900/hour. In fact, yes, they are ALL volunteers. These tweets and images are textbook cyber-threats which stir up the right-wing base generating more cyber-threats on volunteers expressing their First Amendment Rights. A civil discussion is not the intent here. The Internet’s ability to forge connections enables stalking by proxy, whereby perpetrators recruit strangers to help them stalk victims, and group cyber stalking, whereby more than one person is involved in the online abuse. Online harassment can quickly become a team sport, with posters trying to outdo each other. Posters compete to be the most offensive, the most abusive. An accurate name for such online groups is cyber mobs. The term captures both the destructive potential of online groups and the shaming dynamic at the heart of the abuse. Yes, you are reading that right. His tweet was at 2:49 am, shortly after he made the phone call.